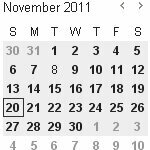 After a friend coaxed me to switch from Hotmail to Gmail back in 2006 – I soon discovered Google Calendar. And, what a life-changer it was! I’ve mentioned before how I struggle with things slipping my mind. Call it age or brain farts – I just have a penchant for misremembering. G.Cal (what I’ll refer to it furthermore) is an Ajax-driven interface and an app brother to Gmail which allows a user the ability to click on a date and enter in an appointment. And, if an appointment gets changed, all a person has to do is click on it and move it to another date. This is what first wowed me about the application when I first used it. G.Cal has come a long ways since its inception. It’s newer features include flairs to highlight specific events/activites and the ability to see other friends/family members schedules to check their availability. I want to share with you a few ways G.Cal can help you with time management and save you money. Please share with me some of the ways you are using it to do the same. Birthdays/Anniversaries. As I guy, I can’t tell you how important the remembering of important dates is. Forget the first date you ever had with your wife or your anniversary – and you could be repenting for days, if not weeks. G.Cal is very equipped to help us guys in this area. Bill due dates. A great use for G.Cal is to remind you of bills coming due. As you are trying to become a financial wizard, you don’t want to fall prey to late fees! Those are killers. At the end of every month, I enter in next month’s bill due dates. I should never, ever have to pay a stupid-tax on a late bill again. Notifications. I love this feature. Whenever an appointment is coming due, I can choose to get an alert via email and/or through my smartphone. I actually have both set-up in case I miss something. I have an iPhone, so my notice shows up much like a text message would. It’s very slick and helps me stay on the ball. Sharing. Another fantastic feature of G.Cal is the ability to share your calendar with friends and family. You can also include their calendar on your calendar. Each calendar that you have is color-coded to keep things straight. But, this is great for a large family to help track all its members or just for busy spouses to keep schedules from getting mixed up. Invites. Use G.Cal to send out invites to friends/family for various happenings. You can track those who are coming and those who have declined. Expiration dates. Perhaps you have coupons you want to track, oil changes, furnace filters, or you name it – the calendar can notify you when a expiration is coming due – saving you $$. I know there are other uses for G.Cal out there too. What have you got for me? Will plastic be the new paper? Haha – yeah, Hotmail was the thing back then – email “anywhere”!